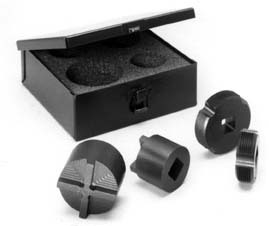 New design reduces the camming action created by torque, making it easier and safer to keep the tool fully engaged in the cap (adjusting screw) when removing and installing the cap. The Thread Chasers clear the cap threads on the axle casting so the threads are not damaged, saving the spindle assembly. Includes: 1 7/8 Cap Removal Tool and Thread Chaser for 10,500 and 12,000 lb. axles and a 2 3/8 Cap Removal Tool and Thread Chaser for 16,000, 18,000 and 20,000 lb. axles. No returns once tools have been used!